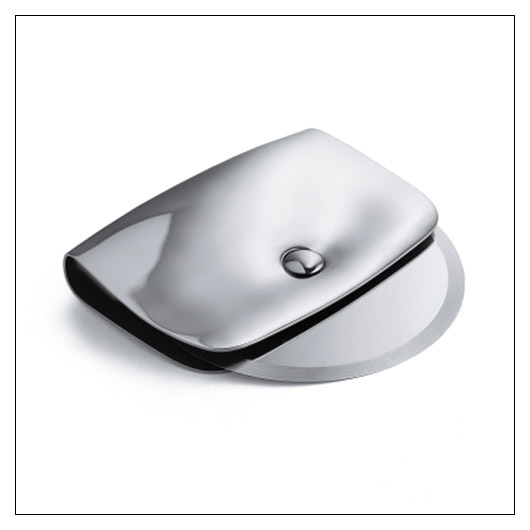 Alessi Taio Pizza Cutter (ALTAIO) at Pure Design / Accessories / Kitchen ::: Furniture for the Home, Office, Home Office, and More at Pure Design Online! The Taio pizza cutter, designed by Valerio Sommella, is an object with soft and sinuous shapes. Taio resembles a box, a pouch into which the pizza cutter has been inserted. Sommella has managed to recreate the typical softness of fabric in a hard material like steel, giving the item an attractive and sophisticated feel. "Lower 48" United States sales only.